William A. (“Sandy”) Darity Jr. is the Samuel DuBois Cook Professor of Public Policy, African and African American Studies, and Economics and the director of the Samuel DuBois Cook Center on Social Equity at Duke University. He has served as chair of the Department of African and African American Studies and was the founding director of the Research Network on Racial and Ethnic Inequality at Duke. Previously he served as director of the Institute of African American Research, director of the Moore Undergraduate Research Apprenticeship Program, director of the Undergraduate Honors Program in economics, and director of Graduate Studies at the University of North Carolina. He was a fellow at the Center for Advanced Study in the Behavioral Sciences (2011-2012) at Stanford, a fellow at the National Humanities Center (1989-90) and a visiting scholar at the Federal Reserve’s Board of Governors (1984). He received the Samuel Z. Westerfield Award in 2012 from the National Economic Association, the organization's highest honor. 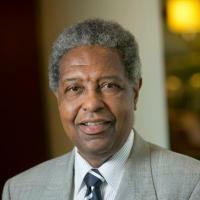 He is a past president of the National Economic Association and the Southern Economic Association. He also has taught at Grinnell College, the University of Maryland at College Park, the University of Texas at Austin, Simmons College and Claremont-McKenna College. He has served as Editor in Chief of the latest edition of the International Encyclopedia of the Social Sciences, (Macmillan Reference, 2008) and as an Associate Editor of the new edition of the Encyclopedia of Race and Racism (2013). His most recent books are Economics, Economists, and Expectations: Microfoundations to Macroapplications (2004) (co-authored with Warren Young and Robert Leeson) and a volume co-edited with Ashwini Deshpande titled Boundaries of Clan and Color: Transnational Comparisons of Inter-Group Disparity (2003) both published by Routledge. He has published or edited 12 books and published more than 210 articles in professional journals.